Clearance Up to 70% Off! This Sixteen Panel Prescreen Mega Plus Cup is one of the most popular choices for a prescreening drug test. 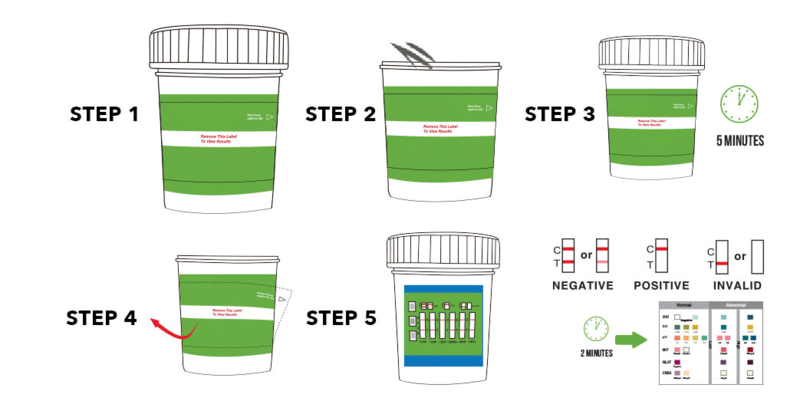 This urine test cup can detect up to 13 different illicit drugs in one testing. This is a great choice, when it comes to performing a large drug testing. These cups have specialty drugs so they are great for Zero Tolerance drug testing. The test results are available in 5 minutes or less, after collecting urine sample. These test results can remain stable for 60 minutes. The drug test has up to a 99% accuracy rate. Check the expiration date on the box. Do not use the test if it is expired. Have a watch, clock or timer ready. NEGATIVE: Two colored bands appear on the membrane. One band appears in the control region (C) and another band appears in the test region (T). Certain lines may appear lighter or thinner than other lines. A line is to be considered a line whether it is faint, light or dark. *NOTE: The shade of red in the test line region (Drug/T) will vary, but it should be considered negative whenever there is even a faint pink line. POSITIVE: Only one colored band appears, in the control region (C). No apparent colored band appears in the test region (T). INVALID: Control band fails to appear. Results from any test which has not produced a control band at the specific read time must be discarded. Please review the procedure and repeat with a new test. If the problem persists, discontinue using the kit immediately and contact your local distributor. Store as packaged in the sealed pouch at room temperature. The test device is stable through the expiration date printed on the sealed pouch. The test device must remain in the sealed pouch until use. DO NOT FREEZE. Do not use beyond the expiration date. Q. The drug line is lighter than control line. Does it mean the drug is present in the urine? A. No. The drug line may be darker or lighter than the control line. The line intensities of different drugs will vary for many reasons. No matter how faint the drug line appears on the test strip, it is considered a negative result. No further testing is required. Q. What does a Negative Result mean? The urine sample was collected at wrong time. It was collected before the drug got into the urine or after it was no longer in the urine. The person took a drug other than the one tested for in this test; e.g. they might have taken LSD, when this test is for drugs other than LSD. Q. What does an Invalid Result mean? A. If any of the strips do not show a control, the result is invalid. We recommend that you re-test or call our toll-free help line at 1-866-465-2855 for technical help. Q. When is the best time to take the test? The Substance Abuse and Mental Health Services Agency (SAMHSA) has set cutoff levels when testing for marijuana, cocaine, amphetamine, opiates, PCP, Ecstasy and methamphetamine. Screening tests may not detect amounts of drugs in a urine sample that are below the cutoff level. Even if some drug is present in a urine sample, the sample would be considered negative if the drug level is below the cutoff level. Q. How much urine do I need? A. The Drug Tests In Bulk PreScreen Plus Test (CLIA Waived) requites just 30 ml of urine. Fill the collection cup of the minimum fill line on the side of the cup. This is enough urine for the initial test and confirmation testing if needed. Q. Do I have to wait the full 5 minutes before reading the test? A. Yes, we recommend that you wait the full 5 minutes before reading the result. Q. Are there any factors that could affect the drug testing result? A. Yes, certain factors may affect the drug testing result. Certain over the counter medicines and prescription medicines may cause a preliminary positive result. Urine can be adulterated (i.e. contaminated or tampered) by using bleach, cleaning supplies and other liquids. This may dilute the urine and the test may not be accurate. Drinking large amount of liquids may dilute the urine so that the drug (if present) cannot be detected. Failure to use the Drug Tests In Bulk PreScreen Plus Test (CLIA Waived) as directed may result in an inaccurate screening result. The following compounds are detected positive in urine by the Drug Tests In Bulk PreScreen Plus Test (CLIA Waived). Concentrations are given in ng/ml; percent cross-reactivity is shown in parentheses. Results vary from 1 hour to 1 Day. Per SAMHSA,THC test results are more limited in all oral fluid testing. See related blog. If out of stock, substitute with similar product? Copyright © 2019 Drug Tests In Bulk. All Rights Reserved.